Columbia, SC, Our combined CWP ("Concealed Weapons Permit") and Basic Pistol training class is a firearms safety class that meets the requirements for a South Carolina CWP and a Florida CWP and a Basic Pistol Certificate. We teach in the Greater Columbia, SC, area. In fact we make our CWP training class the most complete basic handgun class imaginable. We go far beyond the minimum required by South Carolina law and SLED or the laws of most states because we're serious about helping you learn to protect yourself and your family. But we don't charge extra for the real teaching, pistol instruction, safety instruction, training, care, and personal assistance we give you in class. We teach you as if your life depended on your knowledge, skills, and attitude. It does. As you browse this web site read the many comments from people who have taken our classes. They tell you that we know what we're doing, we do it well, and we take extraordinary care to help our students. We teach people at every level from beginners to professionals. We ourselves are trained professional teachers with personal experience in what we teach. It's not just a hobby or a part time job for us. We mean it. We have the depth, breadth, experience, and credentials to give you the best possible training classes. Of course we're SLED-certified CWP instructors. 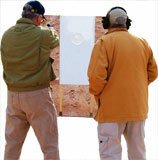 We're also NRA-certified instructors in every personal protection and firearms discipline. 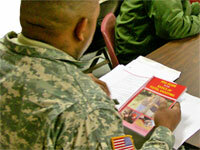 We're even among the small cadre of Training Counselors in the country. As Training Counselors we're entrusted to select, teach, and certify other instructors, including the instructors who teach CWP classes. And as Chief Range Safety Officers we teach the Range Safety Officer training classes and certify range safety personnel you see at shooting ranges throughout the U.S. Remember that your life could depend on what you learn in any Concealed Weapons Permit class. That's why we explain everything for you, starting from the beginning. We pay special attention to teaching you firearms safety. We explain self defence and gun laws carefully so you can avoid problems with law enforcement and stay out of the criminal justice system. You can take our class for just the South Carolina permit, only the Florida permit, or for both permits and more. Many people who already have a South Carolina CWP come to us for a Florida CWP and our Basic Pistol certificate. Other people take our class for just the South Carolina CWP. Some permit holders take our class as a refresher. In fact you don't have to apply for any permit at all. Take the class for your own education if you want. We don't pressure you to do anything you don't want to do. You don't have to be a South Carolina resident to take our classes. Residents of Georgia, North Carolina, Florida, and other states travel to attend our classes for quality instruction at every level. South Carolina does not issue permits to non residents except owners of real property within the state and military personnel on permanent change of station (PCS) in the state. South Carolina does honor the resident permits of those states with which it has a reciprocal agreement. It does not honor a non-resident permit from any state. Keep track of the South Carolina and Florida reciprocal states through the reciprocity links on the left hand side of every page in our web site. Email us now for information and an application to take a class. Include your local telephone number so we can call to answer your questions and determine your needs. Every place in our classes is reserved in advance and we want to talk with everyone first. 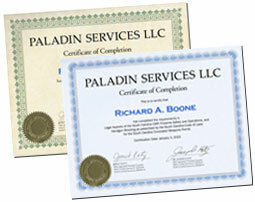 Apply for your concealed weapon permits just as soon as our class is over and we award your certificates. But we do more than just help you get your permits. We teach you what you need to know as a responsible armed citizen. We'll start by teaching you how to be safe around guns. We'll also teach you how to avoid or evade trouble, how to use your handgun to protect your own life and the lives of people you love, and how to stay out of trouble with the law. Our classes are thorough. We'll even help you get a discount NRA membership, extension, or renewal that includes gun insurance and supports your right to own firearms for all lawful purposes including self defence. (Click our NRA membership links right now for a discounted membership, renewal, or extension. Join the millions of us who are the NRA.! When you complete our Concealed Weapons Permit and Basic Pistol class you'll have self-confidence based on real accomplishments. You'll know what to do and how to do it—and of course what not to do too. We teach good people. When you're military you, your spouse, and all qualified family members 18 years of age and older are especially welcome in our classes. Our training is within easy reach of Fort Jackson, Shaw AFB, McEntire ANGB, and everywhere else in the greater Columbia and Sumter area. You qualify for a South Carolina CWP if you're military and: 1. you're a South Carolina resident; or, 2. you're in South Carolina on permanent orders; or, you own real property in South Carolina. Even if you don't yet meet South Carolina's residency requirements our class qualifies you for the Basic Pistol certificate and the Florida CWP now and you can use our South Carolina CWP training certification for up to three years later. Military personnel—active duty or retired—travel from Georgia, Florida, and other states as well as from throughout South Carolina to take our classes. We enjoy helping military personnel and their families get past the hurdles. We've taught individuals and entire families including enlisted personnel, officers, civilian employees, and qualified children. Our training is different from the military's. We focus on how to protect yourself and your people in the civilian world according to civilian rules and laws. Important: Even though we teach in South Carolina our class does qualify Florida residents (and residents of other states) for a Florida CWP. Our classes always start with gun safety. We're so committed to gun safety that this web site has an entire section with information on gun safety for adults and for children too so you have the information you need online even after your class has ended. In our basic pistol class we explain the fundamentals of guns and ammunition and how they work. Then we build on those basics so you understand what you're doing when you use a handgun and why you're doing it. We focus on your needs as a Concealed Weapons Permit holder—whether you're a newcomer to firearms and are apprehensive about them or an experienced gun owner whose skills need sharpening. When you've completed our class you control the gun. It does not control you. Guns do not control people. The gun is only a machine: it has no mind of its own, no soul, and no political agenda. Guns most certainlly do not have any magical power to control anyone. Good people control guns and other machines to make them do good. If you're a parent, grandparent, friend, neighbor, or teacher of young children please take a few minutes to explore The Parents Guide to Gun Safety and Learn Gun Safety With Eddie Eagle. They can help you save your children's lives—and that's our concern too. Eddie Eagle, the animated cartoon hero with the catchy jingle, lets you get started here with your kids right now. Give it a try. We know how to teach. We have several decades of fulltime professional experience helping people learn, we're proud of what we do, and we enjoy doing it. We're not newcomers to teaching adults. You'll find that what our students say is true: we really are on your side and we really can help you. We teach good people who accept responsibility for their own lives and their family's. Civilians need a different perspective from law enforcement and the military. We teach that civilian perspective. Our aim is to help you be safe and stay out of trouble, but if trouble won't let you get away you must prevail. That's why our students include military people, retired law enforcement officers, and their families—the people who understand the need to be prepared at home and on the streets, and who recognize that we teach what they need. So if you want a complete basic class that can give you the South Carolina CWP and the Florida CWP and the Basic Pistol certificate and firearms safety and the ways to protect your own life and the lives of your family in the real world . . . if you want it all, you've come to the right place. That's what we teach and you're who we teach. We teach good people, like you. Our classes are an easy drive on major highways from central Columbia, SC. 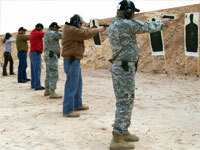 We offer a combined South Carolina CWP and Basic Pistol class in the greater Columbia area. Dates of regularly-scheduled CWP and Basic Pistol classes. We also hold other CWP classes not on that schedule. Please e-mail us with your local telephone number so we can call you to answer your questions, learn your individual needs, and offer suggestions. When we call we'll let you know the dates of any additional classes that might suit your needs. We give complete courses. People travel from outside South Carolina to take them. We'll help you make sense of the complexities involved in carrying the means to defend your life, give you Florida's complete application packet, help you fill it out, and explain what to do next. Get started now by clicking here to email us for more information and an application to take a class. Please be sure to include your local telephone number so we can call to determine your needs and answer your questions. Personal Training is an individual lesson for you with an instructor. Get Personal Training from us when you want or need more attention than you can get in a class with other people. We'll work with you alone or with a family member or friend if you want. We've helped people who didn't feel ready for a classroom setting yet . . . people who were unsure about guns or afraid of them . . . people who had just acquired a new handgun or shotgun or rifle and wanted to learn how to use it . . . military personnel preparing for deployment . . . law enforcement officers getting ready to qualify . . . couples learning to shoot together. Each Personal Training session is two hours, which we've found to be about right for focused work of this kind. We can schedule a session with you and perhaps a family member or friend for a mutually-convenient date and time in one of the available two-hour time slots. Here are the time slots for Personal Training. During your Personal Training session the focus is on you. We'll help you correct your problems, guide you towards more effective practice, and show you skills, tips, and techniques that can make a real difference. We begin every personal training session with a review of the gun safety rules. We end the session by giving you our training certificate to document your achievement. We're on your side. Arrange Personal Training with us as often as you need or want. Our students have seen remarkable results from these two-hour individual tutoring sessions. Learn how you can get Personal Training with firearms in the greater Columbia, SC area. Email us now to get started on your firearms training in South Carolina. Be sure to include your local telephone number so we can call to answer your questions and determine your needs. You're an individual and we want to help you right from the start. And if you're confused by what's required for a South Carolina or Florida CWP we can help you if you email us and ask us to call you.